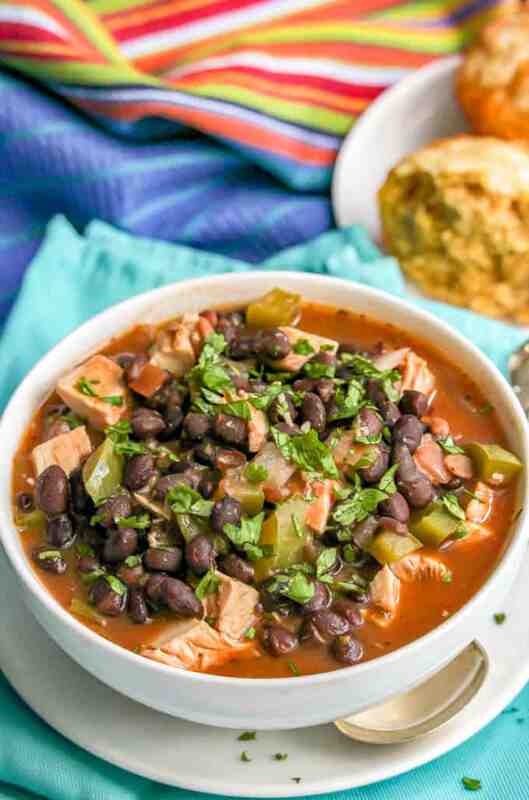 This quick and easy chicken and black bean soup has a great depth of flavor but is ready in about 15 minutes! 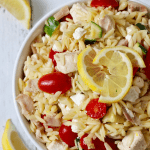 It’s great for a cozy, healthy dinner that’ll warm you right up! Despite M having a fever late last week and despite a non-ideal weather forecast, we were able to squeeze in a camping weekend! We had to make it just one night, instead of two, but we had a blast! The weather ended up being fine and M was of course recovered and feeling good by the time we left. I especially loved sitting in one of our camp chairs, as the fire was dwindling out that night, looking up through the tall trees to the dark sky that was lit up by stars everywhere. And to top it off, we came back on Sunday and my husband had tickets to go to the Carolina Panthers football game. It was exciting right to the end and we pulled out a win! All so worth it, even if I’m starting the week a little bit exhausted… so let’s move on to some FOOD talk! 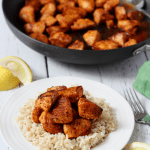 Today’s recipe is a long-time family favorite. 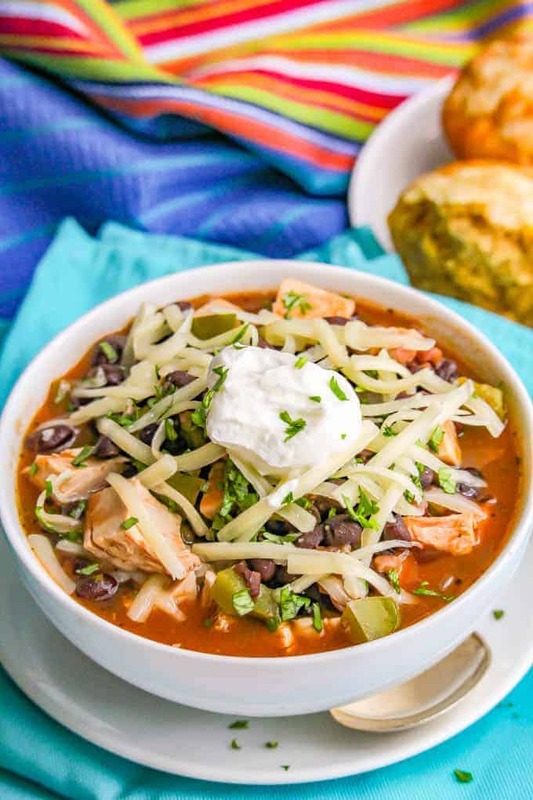 This easy chicken and black bean soup was a recipe that my mom gave me years ago and I’ve only slightly tweaked it since then. 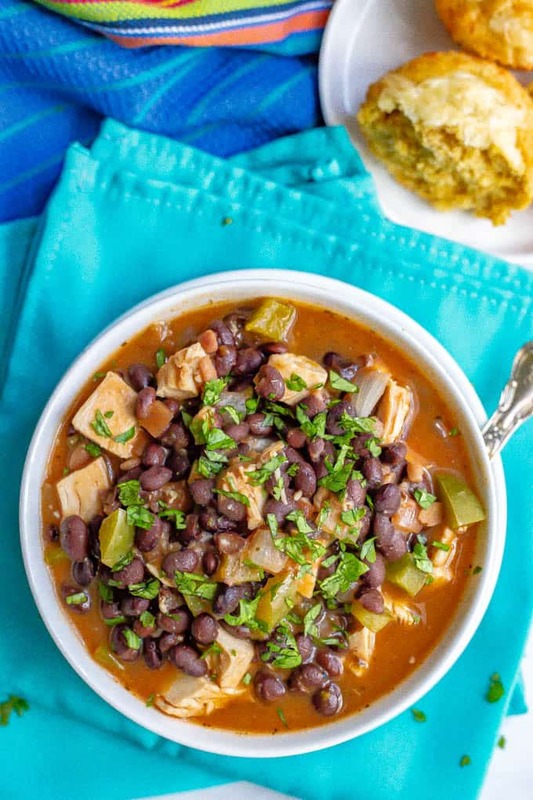 The main change in this soup is my secret ingredient — refried beans! They add so much creaminess and flavor to the soup. You’d never know it only cooks for about 10 minutes because there’s such a great depth to the soup. 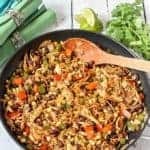 To help make this recipe go quickly, chop your veggies and start them in the pan. While they sauté, prep your beans and chicken to add in when it’s time. I prefer to mash one of the cans of the black beans. It helps add a creamy consistency to the soup, I think, but you can skip it. I use just a regular store-bought salsa that’s on the chunky side. 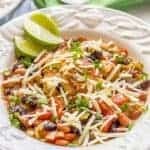 You could use a spicy salsa to add a little kick to this soup. I don’t recommend using a fresh salsa or pico de gallo, since you’ll be cooking it. This soup calls for pre-cooked chicken. I use a rotisserie chicken, but you could also bake or grill your chicken ahead of time if you prefer. This soup freezes and reheats great! Oh, and don’t forget to add your favorite toppings! Cilantro, shredded cheese, a dollop of sour cream or Greek yogurt, tortilla chips, diced or sliced avocado, hot sauce, etc. We love serving this with some of my easy cheesy cornbread muffins on the side. It’d also be great with a slice of cornbread or some fresh baked bread. 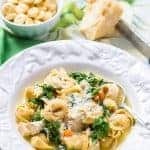 I hope this soup will warm you up on a chilly evening! P.S. 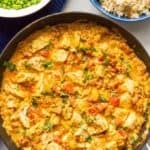 Check out all of my chicken recipes in under 15 minutes for other quick and easy weeknight dinners. 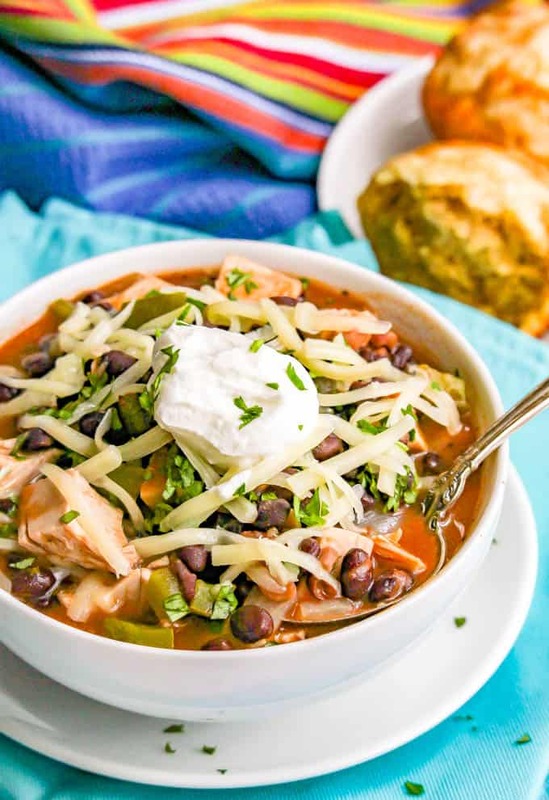 And if you love soup like I do, don’t miss my cheesy chicken and broccoli chowder, healthy slow cooker chicken chili and my 15-minute easy turkey noodle soup. 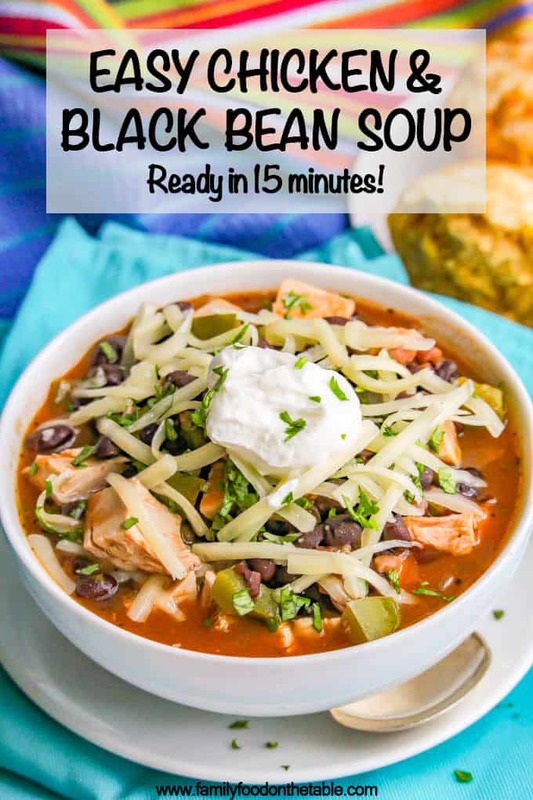 This quick and easy chicken and black bean soup has a great depth of flavor but is ready in about 15 minutes! Shredded cheddar or Monterey Jack cheese, sour cream or Greek yogurt, chopped fresh cilantro, avocado, hot sauce, etc. Heat oil in a large pot over medium heat. Add onion and bell pepper and cook for 5-6 minutes, until softened. Add chicken broth and bring to a low simmer. Whisk in the refried beans until they are well incorporated. Add beans, salsa and chicken and cook for 2-3 minutes, until warmed through. I’ve also added in some chopped zucchini and that was good here too. You could also wilt in some spinach at the end if you wanted some more veggies in here. I prefer to mash one can of the black beans. It helps add a creamy consistency to the soup.